Education is a virtually inarguable asset. On any subject, the more someone knows, the more advanced are any conversations on the subject. The value of education is apparent in any conversation dealing with finances and investing. Spectrem research regularly shows that affluent investors value their own education as well as the current and eventual education of their children and grandchildren. Much time is spent by wealthy investors making certain the financial necessities of future education of offspring are supported and funded. However, there is a concern in the United States about the financial literacy of young Americans. Many school systems long ago dropped simple home economic classes from their curriculums, and many people get their initial education in matters of finance and investment from the School of Hard Knocks. Advisors are often required to determine the financial educational level of investors before they begin working with them, to determine what investors already know and what they need to know to understand the intricacies of their investment strategies and decisions. Spectrem’s new study looks into the current financial educational levels of affluent investors, both self-professed and proven with preliminary level testing. The Financial Literacy Gap Among Millionaires asks investors about their financial education background, how they educate themselves on financial matters today, and whether they depend on their advisor to provide education as part of their duties. Initially, investors were asked about their financial literacy background. Only 37 percent of all investors said they have ever taken a financial literacy class, whether it was in high school, college or in adult education. However, only 32 percent of investors form the World War II generation ever took a class on financial literacy. Is it the responsibility of a financial provider to fill that role? Is there an advantage in promoting financial literacy by offering a basic class, even if it might be attended online by someone not under contract with the provider for future investment advice? There are life events which prompt an investor to dig into sources to build on their education so they can make informed decisions. Preparing for retirement (58 percent) or an increase in assets or income (54 percent) are the primary reasons investors pursue educational materials. But life events such as marriage or the birth of a child are also effective, as well as any economic downturn that gets the attention of an uninformed investor. Clients with upcoming life events will need specialized education to prepare them for the investment impact of their life change. Advisors should be prepared to offer that education, either personally or through some pre-set program which could be used for any client going through a marriage, birth or upcoming employment alteration. 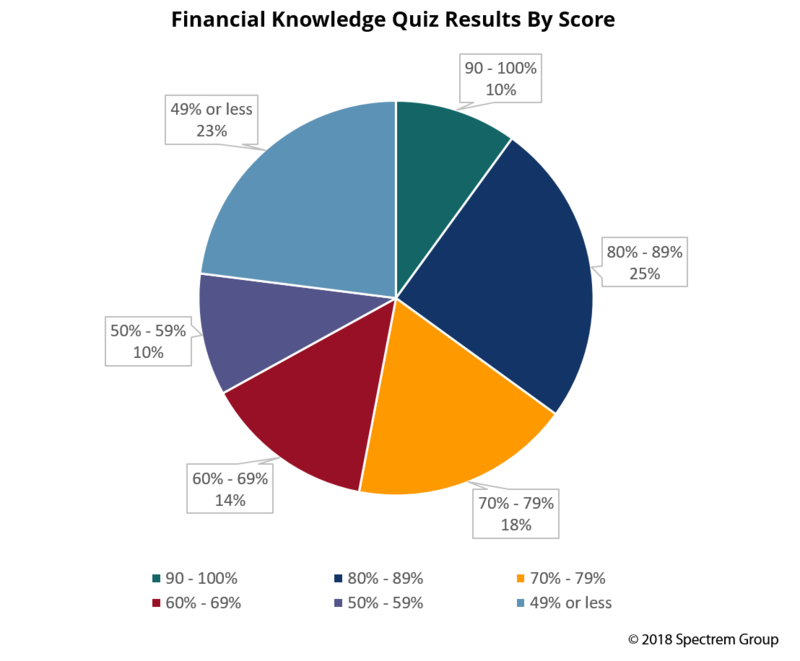 The Spectrem study asked investors to explain how they educated themselves when the need arose, and the good news for advisors is that 53 percent (the largest percentage) said they looked to their financial advisor for educational assistance. Three other sources were noted often – newspapers (40 percent), magazines (39 percent) and books (37 percent). In each case, those educational tools could have been delivered electronically rather than in print form. What role do advisors play in the financial literacy of investors? Do investors require a knowledge test before advisors can begin their work? Must investors understand all the intricacies of their investments and portfolio to be properly served? These are questions financial advisors and providers must ponder. While the educational needs of each investor are likely to be different, the advisor or provider should have some standard by which investors are measured so that all questions are answered and investors are satisfied they know what they need to know about the services that are being provided and advice they are receiving.